Not really fireworks, and not even classified as fireworks these fun little items go by the name, pull string fireworks, pulling tricks, booby traps and several other names they have come to be known by. Pull String Fireworks often come in packages containing dozens. You may be surprised to learn how these multi-colored, small, cheap and noisy items work. Everyone has seen them in action: Give the string a tug, jump when it pops, then watch an unsuspecting friend jump back a few feet! Pull String Fireworks are packed with a tiny amount of gunpowder. The amounts are so minute that they aren’t even classified as fireworks, which is why they can be sold indiscriminately in grocery stores. 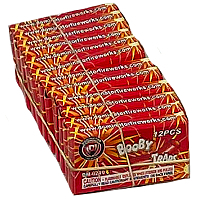 More powerful firecrackers, such as M-80s and cherry bombs, are limited by federal law to 50 mg of gunpowder and under. A booby trap has much less than 1 mg of total powder weight.